OTTAWA — The Liberals' efforts to put the SNC-Lavalin affair behind them were stymied once again Tuesday by the former cabinet ministers at the centre of the political storm, as Jane Philpott argued that Justin Trudeau violated MPs' rights when he expelled her and Jody Wilson-Raybould from the governing party's caucus. Philpott asked the Speaker of the House of Commons to rule on whether the prime minister violated parliamentary privilege when he ejected the pair from the Liberal caucus last week, without holding a caucus vote on the matter. She argued that the Parliament of Canada Act, which was amended in 2015 to give MPs the right to a final say on expulsions, was breached. However, Trudeau insisted the law was followed. And, in any event, Speaker Geoff Regan had already ruled Monday in a similar case that he has no authority to interpret or enforce the statute. All of which led Tourism Minister Melanie Joly to conclude that Philpott has "a need for attention." "I think we're moving on and I think my colleagues need to move on, too," Joly said of the former ministers. Later Tuesday, Liberals on the Commons ethics committee agreed, voting down Conservative and NDP motions to initiate a new inquiry into the entire SNC-Lavalin affair. The opposition parties had pinned their hopes on Toronto Liberal MP Nathaniel Erskine-Smith, who has in the past supported a full, independent inquiry into the matter. But even Erskine-Smith, who has a reputation for bucking the party line, voted against the motions. He said that Wilson-Raybould, in a written submission to the Commons justice committee following up on nearly four hours of oral testimony, concluded that she had nothing more to say. And he noted that Philpott has said she believes Canadians have enough information before them now to pass judgment on the affair. All the other witnesses the opposition wanted to call could have made written submissions to the justice committee if they'd wished, Erskine-Smith said. He added that it "does not make sense" to launch a second inquiry when "the two principal people in this who have raised these concerns have said they have nothing more to add." Wilson-Raybould has said she was inappropriately pressured last fall by the Prime Minister's Office and others to intervene to stop the criminal prosecution of SNC-Lavalin. The Montreal engineering giant is facing bribery charges related to contracts in Libya. Wilson-Raybould believes she was moved out of the prestigious justice portfolio to Veterans Affairs in a mid-January cabinet shuffle as punishment for refusing to override the director of public prosecutions, who had decided not to offer SNC-Lavalin a remediation agreement, a kind of plea bargain. She resigned from cabinet a month later. Philpott followed suit a few weeks after that, saying she'd lost confidence in the government's handling of the SNC-Lavalin case. However, the new rules also left it up to caucus members, at their first meeting following an election, to decide whether to opt into the Chong reforms. The act states that recorded votes are to be held on four different provisions, including the provisions on expulsion of caucus members. Those votes never occurred in the Liberal caucus following Trudeau's victory in 2015. Rather, the newly elected MPs — presumably including Philpott and Wilson-Raybould — voted unanimously to defer the matter to the Liberal party's next convention. Chong's reforms were never discussed at two subsequent Liberal conventions. Philpott said that left her, Wilson-Raybould and other MPs who might run afoul of Trudeau in the dark about how to fight an expulsion effort and how they might be readmitted to the Liberal caucus. Montreal MP Francis Scarpaleggia, the Liberal caucus chair, said in an email that "by implication, the Liberal caucus did not opt in to the Conservative's (Chong's) suggestions for how to conduct internal caucus business," which meant decisions about caucus membership remained the party leader's prerogative. Scarpaleggia said he informed the Speaker in the fall of 2015 of the caucus's decision not to use the Chong reforms this term. However, Chong himself said the recorded yes-or-no votes are "mandatory" — the language of the law is clear — and that because they did not take place, Trudeau acted illegally in expelling Philpott and Wilson-Raybould. Still, he acknowledged that "no court in the land" will touch the issue of how MPs handle themselves in Parliament, so the former ministers' only recourse is to appeal to the Speaker. Had the rules laid out in the Parliament of Canada Act been applied, Philpott said 90 Liberal MPs would have had to vote in a secret ballot to eject her and Wilson-Raybould. Instead, Trudeau made the decision "unilaterally." "We were expelled prior to the commencement of the Liberal caucus meeting," she noted. Trudeau later acknowledged the decision to give the pair the boot was his but added: "I can reassure everyone and say very clearly to both Dr. Philpott and Ms. Wilson-Raybould that I consulted extensively with caucus over the preceding weeks." "The will of caucus was very, very clear that they wanted the two individuals removed from caucus. It was my decision to make but the fact that the caucus was clear and united on that made my decision easier." 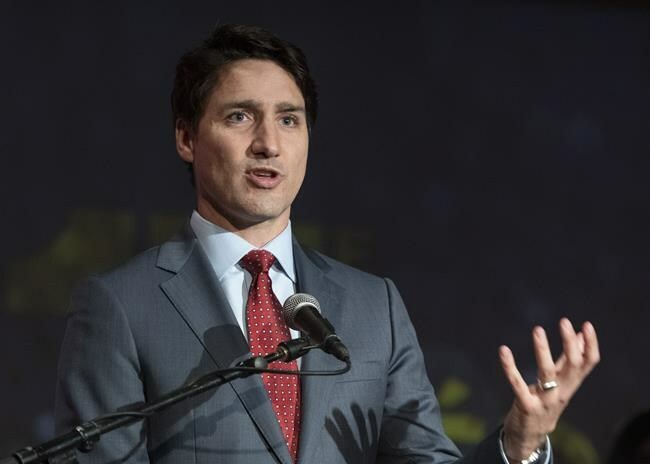 Conservatives, meanwhile, continued Tuesday to taunt Trudeau over his threat to sue Tory Leader Andrew Scheer for making allegedly libellous statements about the prime minister's handling of the SNC-Lavalin file. Scheer himself retweeted the statement that prompted the libel notice while his MPs repeatedly dared Trudeau to set a date for legal proceedings to begin. Trudeau was unrepentant, arguing that with an election coming up, it's important that politicians be discouraged from twisting the truth and distorting reality. "You can't be lying to Canadians," said Trudeau. "It's not something we're going to put up with."